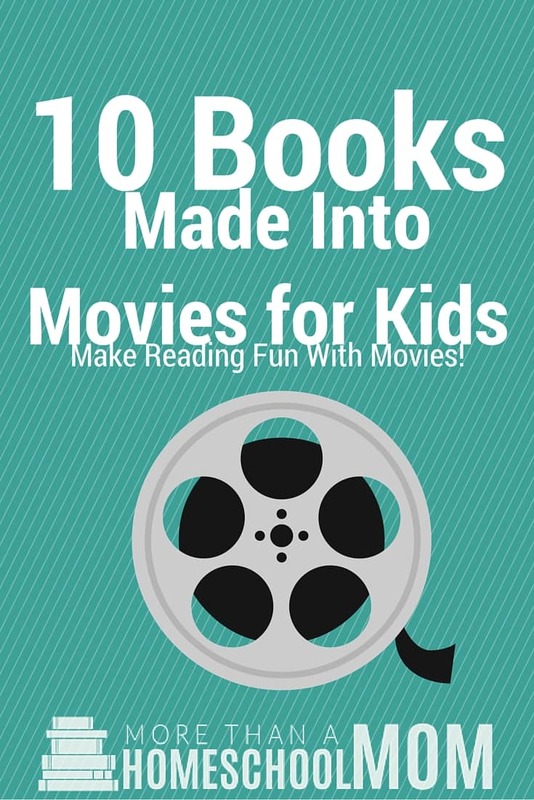 10 Books Made Into Movies - Great way to get kids reading! I have always been a huge fan of developing reading skills in children. For some children, reading can be difficult or frustrating. This is the case with R at times due to her dyslexia. Instead of admitting defeat I found a fun way to motivate her to read. I told her that she could watch any movie that goes with a book she is approved to read after reading the entire book. Here are 10 books made into movies for kids that you can use to encourage your child to read more. I highly suggest letting your child read the book before watching the movie. Have them watch the movie to spot the differences. The differences they spot will give you a good view of where they are with comprehension as well. Make sure you are choosing a book on your child’s reading level. A book that is too difficult can frustrate your child more and cause them to dislike reading. These books are a fairly simple read but they are a lot of fun. The movie does take some creative freedoms that are different from the book. Be prepared to hear about some of the things that are left out or done wrong. These books are a classic but the movies that were put out for them are very well done. Your child is sure to enjoy both the books and the movies. I highly suggest starting with Magician’s Apprentice and going forward from there if they read them. These books are an excellent series to get your child involved with. They are all a lot of fun and have some great plot lines. If you have a Kindle Fire Kids Edition they are all free with Kindle Free Time. The movies are very well done and there is a lot of bonus information the kids can get involved with after watching it. This series is a lot of fun. I will warn you that the movie completely changes everything. In fact, I spent the entire movie complaining about how drastically they changed things. It would be a great example about how just watching the movie can cause you to miss out on a great deal. This series is a lot of fun if you have a really goofy child. The movie stays pretty close to the book and is a lot of fun. This series is a bit more down than some of the others. However, it’s an excellent series that is fairly easy to read. The movie is well done and the series is being made into a live action show for Netflix. This book is a classic as are the movies. It could be great to not only read this book but follow it while watching both versions of the movies to see if they are handled differently. This can be a great lesson on creative license. The book for this is completely different from the movie you may have grown up with. Read the book first and then look at all the differences between the book and the movie. I highly recommend checking out Saving Mr. Banks if you decide to watch Mary Poppins. Before this popular movie came out I didn’t realize this was a book series. This would be a great read if you have a dragon lover in the house. The movie is a cartoon and not a live action movie if you have not seen them yet. This is another classic that has a movie retelling. It could be a lot of fun to have your child read the book and then spend time with the movie deciding what was changed and how they would have done it better. What books that were turned into movies do your children enjoy? What do you do with them? Leave me a comment. I would love to hear from you. City of Ember is another good book that was turned into a movie. My daughter (age 10) is also into the Guardians of Ga’hoole series, which had a movie made out of it. (Though she tells me they changed the movie quite a lot.) And she LOVES the How to Train Your Dragon movies and also the cartoon series (found on Netflix). I haven’t heard of either of those. I will have to check them out for sure.